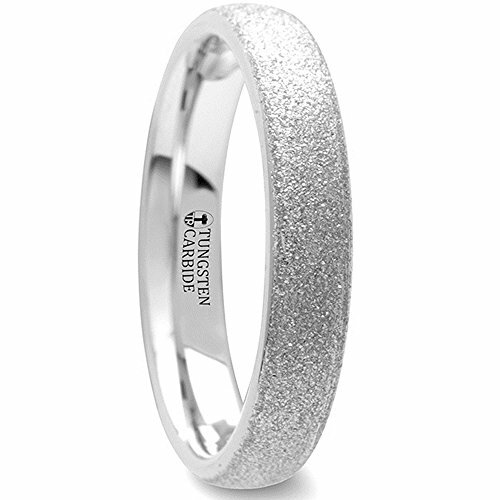 This exotic style from our tungsten carbide wedding bands collection has a unique sandblasted finish. It gives the ring a sparkling look, which looks like the surface of the ring is embedded with tiny rose gold colored crystals. The ring itself is made of tungsten carbide and has a domed or rounded shape. This ring comes in 4 mm and 8 mm for couples who prefer a matching set and is the perfect wedding ring to represent your love and commitment. Tungsten Carbide is ideal for men and women who are tired of rings that scratch easily. Truly Free Lifetime Sizing and Lifetime Warranty on all tungsten rings, no exchange|sizing fees, which are charged by our competitors.